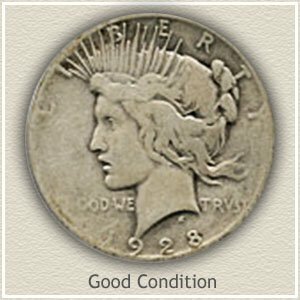 Starting 1924 Peace silver dollar value is $17.87 currently. Additionally there are a couple of factors you should consider to accurately find its maximum worth. 1)	Presence of the "S" mintmark often leads to higher value, especially if your coin is in above average condition. Using the images and description below the value chart, finding the mintmark is easy to confirm. Above average condition, leads to the second major factor. 2)	Judging the condition of Peace dollars is more complex but worth taking a little time to determine. The greater amount of detail that remains on the surface, the closer to collectability status. Evident on the 1924 silver dollar pictured is its remarkable preservation. Absent are any signs of wear and original bright luster remains. With the "S" mintmark on the reverse this Peace dollar is recognized by collectors as a scare combination of condition, date and mintmark. Notable is the large jump in value of an "uncirculated" condition coin. Recognizing the visual differences in the quality of silver dollars is covered further down the page. It is helpful to have a magnifying glass handy when looking for mintmarks on your Peace dollar. Two mints, Philadelphia and San Francisco struck silver dollars in 1924. Philadelphia, the main mint did not use a mintmark, San Francisco placed a small, and occasionally faint "S" on the reverse to identify their production. Refer to the highlighted area as shown on the image above. 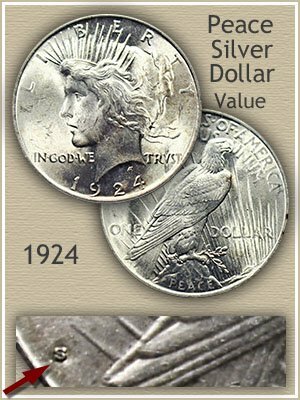 A significant difference in value is attributed to an uncirculated 1924-S Peace silver dollar compared to a slightly worn example. Judging the differences in condition requires a very close look at the surfaces of your coin. In the strictest sense 'Uncirculated" is without any wear, it is this coin that is highly valued. Detecting any wear to a coin starts by examining its mint luster, a delicate element imparted to the surface during the striking process. Luster is comprised of minute flow lines of metal, radiating from the center to the rims, giving the newly minted coin its brilliance. You can spot any breaks in luster by slowly tipping your coin side to side under a single source of light, a few inches from a desk lamp works well. It may take a minute to pick up the subtleness, but as the coin moves luster forms bands of brightness from one rim straight through the center to the opposite rim. These "bands" rotate as the coin moves, and if complete indicates the uncirculated condition. Pictured is an uncirculated silver dollar, the entire surface displaying luster. Next to it is one with trace amounts of wear. Rotating the lightly circulated coin under a light detects mint luster as well, however it is lacking on the upper most parts of the design. First to show signs of wear are Liberty's neck and eyebrow, rays of the tiara and tops of lettering. Take your time, use a magnifying glass, try inspecting some of the newer looking coins in your pocket change, the "aha" moment will come. Time spent judging condition is critical to accurately determining value. Although a certain degree of subjectivity is involved, by following the images and descriptions you get a good idea of the process. Degrees of wear are categorized into "grades" representing the different values on the chart above. 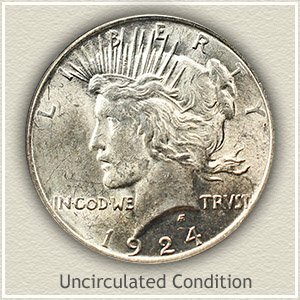 Uncirculated: Complete absence of wear on your coin's surface places it in the "uncirculated" grade. When first minted your silver dollar radiated brightly with a delicate luster. Diminishing quickly with use the high areas of the design should still display luster to confirm the uncirculated grade. Inspect closely the tops of hair curls and along Liberty's neck, a dull grey shade indicates wear. 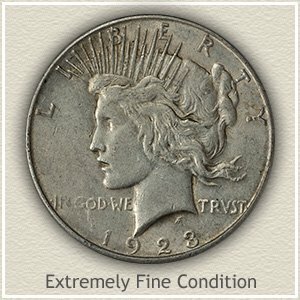 Extremely Fine: 1924 Peace silver dollar value in "extremely fine" condition begins to enjoy a premium. Only very light wear is acceptable for this grade and limited to the very highest parts of the design. A distinct fullness with rounded features to the hair must remain. The tie of hair at the back is still bold with only minimal merging of detail. 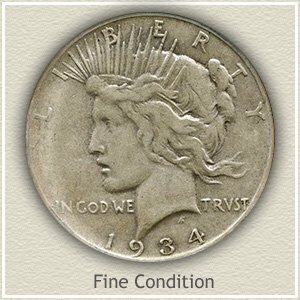 Fine: Moderate wear leaving areas with a flattened appearance is typical of a 1924 Peace dollar in "fine" condition. Obvious wear has leveled the once rounded cheek and neckline of Miss Liberty. A smoothness and flatting of the once rounded hair behind the flowing curls is a good indication of this grade. Good: Large flat undefined areas dominate Liberty's portrait. Only the deepest of detail remain, finer curls and folds on the back of her head have worn smooth. Lettering is becoming faint, typically the "L" and "T" of LIBERTY. There are just too many 1924 Peace dollars in this condition to realize any collector premium. They trade at underlying silver value fluctuating with bullion prices. Current minimum silver dollar values are $17.87 for any Peace dollar and $17.98 per Morgan dollar. Older Seated Liberty series are very scarce and worth hundreds. Value charts cover these and all dates and mints.